We provide a full range of global exhibition transportation logistics and focus on handling all your transportion needs, whether you require your exhibition stand transported by road, sea or air to any location in the world. We provide a professional service that you can rely on and trust. 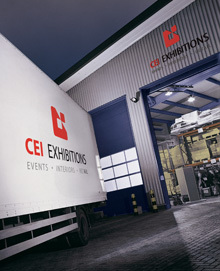 With over fifteen years of industry knowledge and experience, we offer an unrivalled service for exhibition transport logistics in the United Kingdom. We provide domestic and international services, ensuring your exhibition stand arrives safely anywhere in the world. Our team focus on ensuring your stand arrives on schedule at all times and will co-ordinate the shipment(s) on your behalf and handle all customs clearance for you, ensuring total peace of mind. We have our own fleet of vehicles varying in size and capacity. Due to our convenient location, just off the M25 motorway, we are able to provide seamless and hassle free transportation services throughout the United Kingdom and Europe, enabling you to enjoy complete reassurance that your stand will arrive on time and in perfect condition, ready to be installed and commissioned. Whether you would like a quote, ask a question or get some essential advice relating to exhibition transportation and logistics, feel free to contact our team.